Er, no -- it is Alan White. Mr. Bruford was long gone by this stage, having played his last show with the band in March 1972. He quit Yes after the recording of 'Close to the Edge' was completed and definitely did not play any shows on the tour for the album. Alan's first gig with Yes was July 30, 1972 in Dallas, Texas and he has remained the drummer in the band ever since. 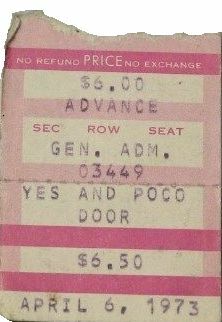 Excluding ABWH, Bill didn't play live with Yes again until April 1991, on the 'Union' tour. BILL BRUFORD ON DRUMS HERE..NOT ALAN WHITE..
UNBELEVABLE, I WAS IN COLLEGE, A GROUP OF FRIENDS CAME DOWN FROM CEDAR CITY, UTAH, FOR THE CONCERT. I HAD BEEN TURNED ONTO YES, AND JUST COULDN'T STOP LISTENING TO FRAGEL. WE WERE ABOUT TEN ROWS BACK, WOW, IT WAS AN EXPERIENCE THIS 54 YEAR OLD WILL TAKE TO THE GRAVE. THANKS GUYS. To this day no other concert has had the same impact on me. I can only describe it as a spiritual experience. Poco was the warm up act. Interesting combination. I spent many years after that show on a "Yes High". I wish I could go back. I was at this show. I was in the U.S. Air Force at the time serving at Nellis AFB. OUTSTANDING SHOW! This show was the defining moment in my musical growth. I mind altering experience in more ways than one. I helped a friend of mine into the show and - he helped me out. From this show on I never looked at music the same. THANKS ! I was there but it was the Las Vegas Ice Palace, an minor league hockey rink. They did not allow rock and roll at the Las Vegas Convention Center at this time. Hippies freaks would damage the fine seats at the Las Vegas Convention Center ya know. A great show, I would love to relive that night!